Intelligent Energy Management Electric Power ,Robotics and Automation (IEMERA - 2019) will be organised by the Department. of Electrical Engineering, Institute of Engineering & Management, Kolkata, in the month of August 2019. IEMERA- 2019 aims to provide a premier platform for Electrical, Electronics and Computer engineers, researchers, scientists and academician from universities, research organizations and industries to present their work and to share experiences and ideas in the emerging areas such as Renewable Energy, Energy storage, Power Electronics & drives, Smart devices and communication systems, Artificial Intelligence, Robotics, Control and automation etc. 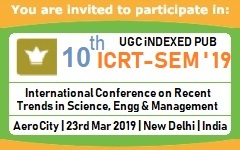 The accepted & presented papers will be published in peer reviewed SCOPUS index proceedings of Taylor & Francis (CRC Press).